Laparoscopic ureterolithotomy is a procedure to remove stones from the ureter. 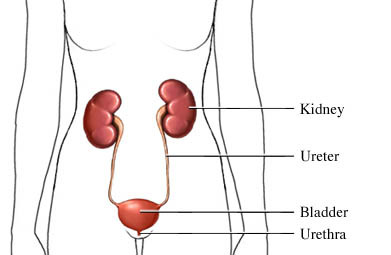 The ureter is a tube between the kidney and the bladder. Urine passes down to the bladder through this tube. Laparoscopic procedures use small incisions and specialized tools. This helps to avoid large incisions that are used during open surgery. Talk to your doctor about any medications you are taking. Do not start taking any new medications, herbs, or supplements without talking to your doctor. You may be asked to stop taking some medicines up to 1 week before the procedure. Arrange for a ride home from the hospital. Arrange for help at home as you recover. A few small incisions will be made in your abdomen. Specialized tools will be inserted through the incisions. The tools will be used to make an incision in the side of the ureter. The stone will be removed through this incision. A stent may be placed in the ureter. This will support the ureter while it heals. The incision in the ureter will be closed with stitches. A drain may be put in place. It will help fluids drain from the area while you heal. When the tools are removed, the incisions in the abdomen will be closed with stitches. Bandages may be placed over the incisions. The stone may be sent to a laboratory for testing after surgery. Anesthesia prevents pain during surgery. As you recover, you may have some pain. Your doctor will give you pain medication. The usual length of your hospital stay is 2 to 4 days. If you have any problems, you may need to stay longer. You may need oxygen for a brief time after your operation. You will have a tube near your incision. It will drain blood and fluid from the area. The tube may be removed within 3 to 4 days of surgery. You may have an IV until you are eating and drinking normally. You will have a catheter that will drain your urine. You may be encouraged to exercise by walking soon after surgery. You may be given blood thinning medication to prevent clots. Kidney stones. National Institute of Diabetes and Digestive and Kidney Diseases website. Available at: https://www.niddk.nih.gov/health-information/urologic-diseases/kidney-stones. Accessed March 7, 2018. Patient information: Open removal of stone from ureter. Addenbrooke’s Hospital NHS website. Available at: http://www.camurology.org.uk/wp-content/uploads/ureterolithotomy-44.pdf. Updated April 2014. Accessed March 7, 2018. Ureterolithotomy (open) consent form. Queensland Government website. Available at: https://www.health.qld.gov.au/%5F%5Fdata/assets/pdf%5Ffile/0024/145824/urology%5F21.pdf. Accessed March 7, 2018.